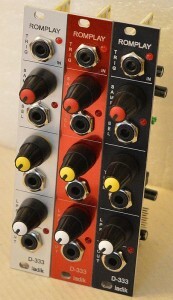 D-333 ROM player module for Eurorack / Doepfer A100 system. 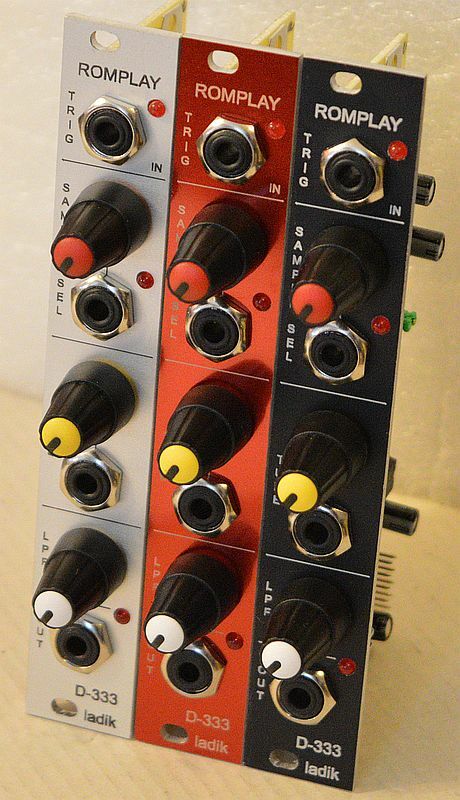 Trigger/gate input + LED, sample select knob + CV input jack + LED, tume knob + CV input, LP filter knob, output jack + LED. Sample memory 30kB, 12bit DAC. Jumper 1: plays whole sample (jumper not set) or stops playing at gate ends (jumper set). Useful for shortening slowed down samples. You´ll get D-333 with one soundbank IC installed, write three-digit number of selected soundbank IC to paypal message field please, see IC-333 soundbank for D-333 (more soundbank ICs can be ordered, IC in D-333 module is socketted).